Photo Project “52 Bolivian Sundays” [week 39, ‘Saturated’: the Quena Case]. This photo was taken during one of our recent hikes, just outside La Paz, through the Valle de La Luna unique geological formations. Flute players, Andean musicians usually come over and greets adventurers and pass-byers with their art… in more ways than one! This beautiful wood case is commonly used to carry the Quena set, the traditional Andean flute. 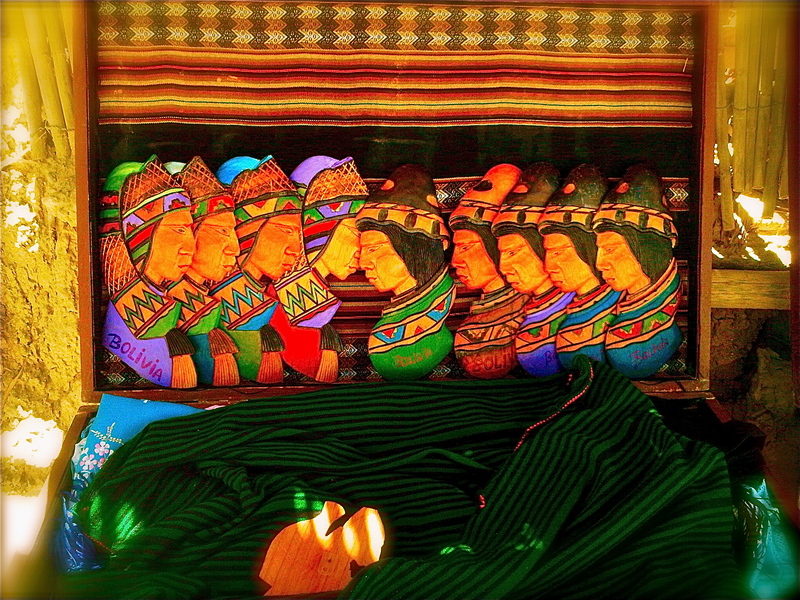 Note the unique wood work inside the case, all the colorful faces, carefully design to represent different Bolivian pueblos. The quena is a South American wind instrument, mostly used by Andean musicians. The quena (Quechua: qina, sometimes also written “kena” in English) is the traditional flute of the Andes. Traditionally made of bamboo or wood, it has 6 finger holes and one thumb hole, and is open on both ends or the bottom is half-closed (choked). To produce sound, the player closes the top end of the pipe with the flesh between his chin and lower lip, and blows a stream of air downward, along the axis of the pipe, over an elliptical notch cut into the end. Quena is mostly used in traditional Andean music. In the 1960s and 1970s the quena was used by several Nueva Canción musicians, this use was in most cases for particular songs and not as a standard instrument but some groups such as Illapu have used it regularly. In the 1980s and 1990s some post-Nueva Canción rock groups have also incorporated the quena in some of their songs; notably Soda Stereo in Cuando Pase el Temblor and Los Enanitos Verdes in Lamento Boliviano. The quena is also relatively common in World music. Author 3rdCultureChildrenPosted on September 28, 2013 September 30, 2013 Categories ART, BOLIVIA, photography, TRAVELTags 52 Bolivian Sundays, Bolivian Sundays Photo Project, kena, photo challenge, postaday, quena, saturated, South America, Valle de La Luna26 Comments on Photo Project “52 Bolivian Sundays” [week 39, ‘Saturated’: the Quena Case].